Finally, Canon is effectively merging two technologies in one high quality digital camera! Is the "Azden shotgun mic" a STEREO mic??? The Azden SGM-1X pictured above is a mono shotgun. It has only one electret condensor to gather sound. The Azden SMX-10 is the stereo version. It has dual electret condensors for the left and right channels. 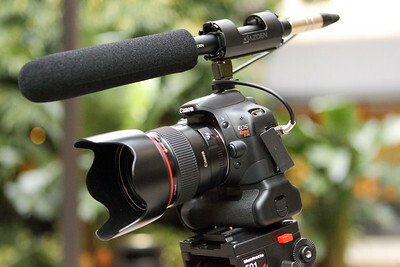 Im a little late to this blog, but I am looking for a hot shoe mounted mic for my T2i. The in-body microphone is no longer cutting it for me. I was wondering what kind of attachments you need to buy in order to put the SGM-1x or the SMX-10 on this DSLR? Does it already come with a mic input cable to plug into the side of the T2i? Another question is, do you think this microphone would do well in loud situations like a concert? If you have an existing XLR shotgun microphone, you just need the Pearstone LMT-100 adapter. It converts the XLR to stereo mini jack. As for a hotshoe mount, the Azden already comes with one on the rubber mounted cage supplied with the shotgun. Just click on the LMT 100 hyperlink in the above PhotoBlog post and it will take you to the B&H website. The shotgun would work well in a concert situation. The only problem you will have is the risk of overmodulating the audio level because you are at the mercy of the Automatic Gain Control. The T2i has no audio level control like the Canon 5D Mark II. All you can do is to do a test before the actual shoot. I posted several T2i articles in my PhotoBlog. All you have to do is to type in "T2i" in the search bar on the top left of the website and hit enter. I hope this helps...Thanks for looking! Thank YOU very much. You seem very informative and I like your choice of cameras. I also notice you're an "official sponsor" of North Tampa Photography. That must mean you live somewhere in Tampa? Small world, Im in that store almost every week. I love that place.